Today in celebration of the arrival of Aunt Lindsay and Uncle Ben we went to play at Chucky Cheese. Annika and Kaleb have never been there before. I have not been there since I was 10 years old but it is still the same. It was cool that her cousins came too to play. Looks like Uncle Ben had a little competition, Annika probably totally beat him she looks like she is pretty serious. 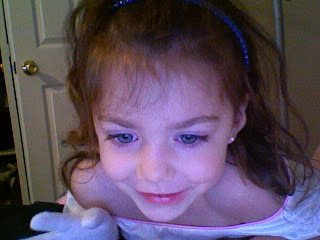 Annika thinks that to be a princess she has to wear her sleeves off of her shoulders. She runs around the house singing and dancing around in her princess outfit. I finally started a blog. I can sit at the cool table at school now. Last Day of Vacation... Time to head home.